I have to be honest and say that I was a little hesitant about this one for two reasons…good quality lamb really doesn’t need too strong a favour companion because the meat itself tells its own story on the tongue. And, Garam Masala is traditionally a spice blend that is deeply flavourful, but essentially means “heat”…apparently not the fiery kind, but rather a quietly comforting, growing warmth within the belly. It is also commonly added towards the end of the cooking, which was going to prove tricky with what I originally had in mind for this dish. 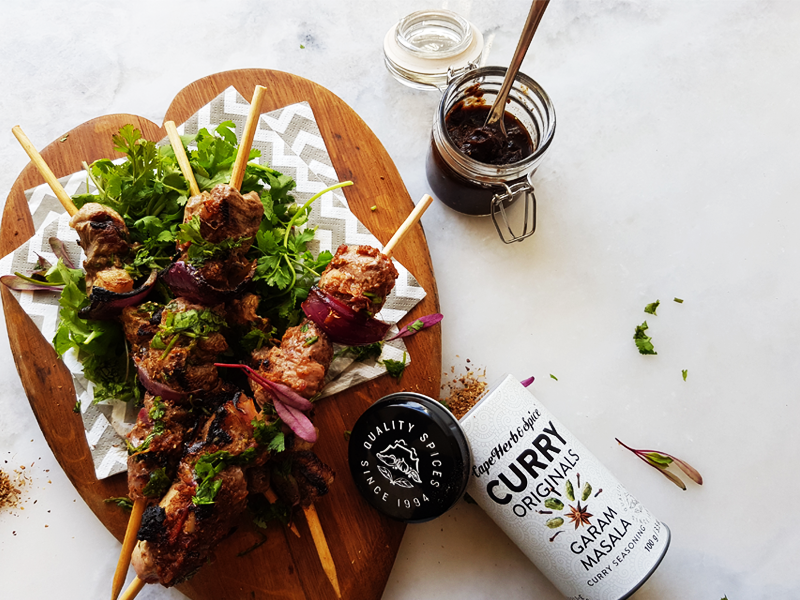 But onwards and upwards, and it turns out that the delicate combination of flavours, rounded off by a complex yet delicious spice blend, sticky tart chutney and a sizzling hot griddle pan – and here we have an exotic dish with a hint of magic! It is said that almost every family in Southern India has its own treasured secret Garam Masala recipe. Typically a blend of highly aromatic and flavoursome spices, the blend is used extensively in Indian cuisine – but it proves versatile and forgiving. The Cape Herb & Spice Garam Masala Curry Seasoning - part of a range of three – is robustly fragrant, inspiring the exotic flavours of India into your kitchen. Therein lies its’ forgiveness, because it’s hard for this sophisticated spice blend not to transport you. Thread your cubed pieces of lamb, interspersed with red onion chunks, onto wooden skewer sticks dipped in water to aid a smooth 'stab'. Coursely crush your remaining flavour ingredients and paste thickly over the kebabs. Allow to marinade for an hour before griddling in a hot pan - turning frequantly to avoid burning. For the tamarind chutney - bring to a slow boil and gently simmer on the stove top for 15 minutes. Allow to cool and decant into a mason jar for safe keeping in the fridge. Serve your kebabs immediately on a bed of fresh corainder, with your sticky tamarind chutney on the side.